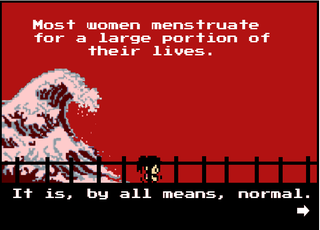 "The taboo that surrounds [periods] teaches women that a normal and natural bodily function is embarrassing and crude." That's the message two teenagers want to send with their new video game, Tampon Run. "Hit all the enemies with your tampons. Don't let them pass you. They'll confiscate your tampons [like the Texas State Troopers during a reproductive rights demonstration]. Collect tampon boxes for more tampons. Don't run out of tampons or it's GAME OVER." To play the game, visit here.